A delightful combination of fall flavors. A delightful combination of fall flavors. Preheat oven to 325 degrees. Line a large rimmed baking sheet with parchment. In a large bowl, mix together multi-grain cereal, sunflower seeds, nuts, brown sugar, salt and cinnamon. In a smaller bowl, whisk together the egg white and water; add agave, maple syrup and vanilla, and whisk until mixture is blended and slightly frothy. Pour agave mixture over oat mixture and, using a large rubber spatula, fold ingredients together until the dry ingredients are well-coated. 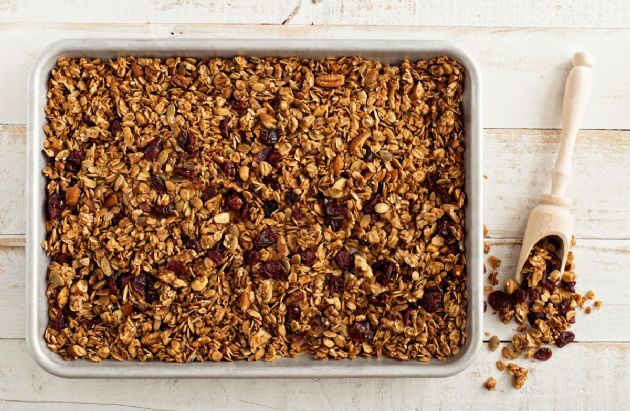 Spread granola on baking sheet; if you want some clumps, squeeze some of the mixture together with your hands. Bake for 15 minutes. Using a spatula, turn the granola gently, moving the mixture from the outer edges of the pan toward the middle and vice versa. Bake 8 to 10 minutes more until lightly browned. Reduce oven temperature to 250; return pan to oven and bake another 15 to 20 minutes until the granola is toasty brown and mostly dried. Remove pan from oven and let cool. Carefully break up into chunks and gently fold in dried cranberries. Store in a plastic bag or container.